These cuts are tighter than a knot in your back after moving all day!!! 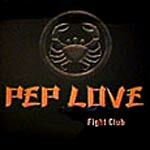 Pep Love comes tight and has back up on production with Evidence and A-Plus. There's so much energy here it's guaranteed to even get the hip-hop haters on their feet! Produced by Evidence and A-Plus. Cuts by Babu and DJ Lex. Remix produced and mixed by Casual. Lyrics by the one and only Pep Love.